ALDINE – Superintendent Wanda Bamberg and the AISD leadership at the last “State of the School District” breakfast addressed the strengths and problems facing the Aldine school district, including how to plan for the future, burgeoning student population growth, and some campuses with low state achievement ratings. As a result, the district decided to conduct a survey of all existing facilities, and seek new and innovative methods for its teaching. To help them with this effort, they are seeking the input of all parents, students, educators and interested parties in the district. In addition, they have hired two consulting firms experienced in this type of facility and educational planning, to help and guide the efforts. Superintendent Bamberg said that this type of new Master Plan has not been done before in the district. The two firms hired to conduct the planning are an engineering firm, Jacobs Engineering, and an educational planning firm, DeJong-Richter. Their contract was approved by the Board of Trustees, at $1.5 million dollars, a sign of the scope and seriousness of this project. The process includes guidance from a steering committee that has met twice and will meet four more times before they make their recommendations in July, and the Community Meetings, which will include two. The next one is scheduled for April 6th and 7th in two different sides of the district. The format for the first Community Dialogue Meeting, held Thursday evening at Campbell Center, was an introduction by Superintendent Bamberg, and short summaries of proposed work by Paul Mills of Jacobs Engineering and David Sturtz of DeJong-Richter. Mills and Sturtz met with the whole audience, about 300 or more interested citizens and educators, in the main basketball arena of Campbell Center to begin, and then later broke up into work groups, centered around tables in three areas of the building. The two men gave a summary of their firms’ qualifications to start, presented in a clear slide show. Jacobs Engineering said they are an engineering and planning firm, that has assessed over one billion square feet of K-12 facilities in 13,000 schools nationwide. DeJong-Richter said they were an educational planning firm that has completed over 260 master plans for over 1800 school districts nationwide. In their presentation, the team first spoke of the survey and the master plan that would result. They said that a Facilities Master Plan is a strategic five-year plan for all school building. The master plan has two parts: the physical facilities, and the education vision. Sturtz said that the master plan needs to be updated every five years, because technology is changing so fast. 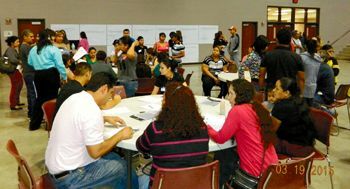 The Facility Assessment, as conducted by Jacob Engineering on all 60+ Aldine schools, was reported out in a thick notebook, with about 10 pages devoted to each school. Facilities were assessed on Condition, Capacity, and Adequacy, they said. This adequacy means the physical buildings must fit the educational vision, which is defined by District Leadership and Citizen Feedback, in the form of both the steering committee and community dialogue. The Facilities Master Plan must combine program needs and goals, and take into account technology and modern learning techniques. The next part of the presentation to the audience was a clever slide and video show of new and different learning methods. Sturtz made the point that traditional education was based on an industrial-based economy, that has now changed to a technology based economy, with both local and global aspects. This new educational technique might be known as Divergent Thinking, with both an individualized approach and a collaborative method. His point is that educational buildings, schools, must be designed differently to enhance and support these new techniques. The presenters then showed a video from the Khan Academy, emphasizing that a better way to learn that categorizing students to various grade levels, is to let them learn at their own pace, regardless of grade. This individualized method can be enhanced by technology, but must be balanced by control of variable such as time spent versus mastery of a subject, and skills learned versus class size resources devoted to the subject. As a result of this thinking, new Concept for Learning can evolve, said Sturtz. So-called flipped classrooms, where students watch the lesson at home, and do their homework in class, is an example. Another example if Project Based Learning, based on student initiative with teacher facilitation. These concepts lead to new building configurations, such as outdoor classrooms, open plans, kiosks, and others. After the presentations, the audience went to three rooms with group tables. They answered a multi-page questionnaire, and then discussed their educational ideas with their tablemates and facilitators. Next, they reassembled in the main arena, and tallied their decisions on wall charts, that will be incorporated in the next round of educational reports and planning by the consultant team, leading to a summary of action plans. It is expected that the final Master Plan report will include recommendations on need for new and remodeled facilities, and new and innovative educational methods.